This year, I had the July 4th long weekend as a holiday instead of Canada Day, so we decided to go somewhere where Canadians wouldn’t be – cross border shopping. We went on the Thursday and Friday (when Canadians would be working) and if that wasn’t enough disincentive, the USD dollar was at a two-year high compared to Canadian (up to almost $1.06). This was also our third year in a row making the trip down there (2010, 2011, also in 2007). 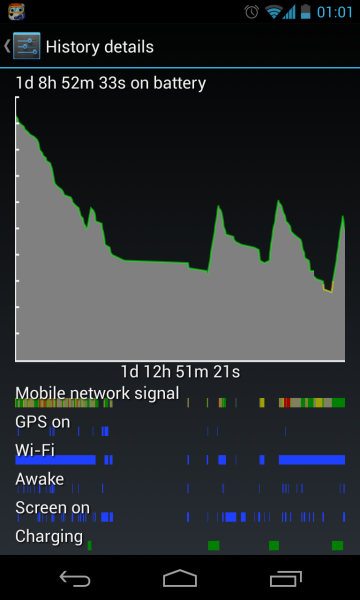 You can really tell when my phone is in airplane mode, it hardly lost any battery – only 2% overnight. The real battery drain is when the phone is connected to the network, either just being on the network or all the background sync that is happening.